The next phase of our Experimental Advanced Renewable Program (EARP) is off and running with the selection of residential customer-initiated solar projects in 14 Michigan counties. 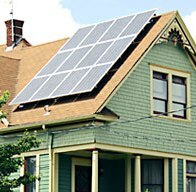 The program provides for the long-term purchase of renewable energy generated by customer-owned solar energy systems. The projects were recently selected during a random drawing of qualified applicants. Projects selected are in the following Michigan counties: Arenac, Eaton, Genesee, Grand Traverse, Hillsdale, Ingham, Isabella, Jackson, Kalamazoo, Kent, Leelanau, Muskegon, Ottawa and Washtenaw. The projects range in size of electricity capacity from 1.3 kilowatts to 15 kilowatts. David Ronk, Consumers Energy’s director of transactions and resource planning, is pleased with the interest in growing solar energy in Michigan. “This initiative supports Consumers Energy’s goal of providing a balanced energy resource for our customers,” he said. Customer installations under earlier phases of the 5,000 kW program have added or are adding approximately 2,700 kW of solar energy to Michigan’s electric system. These 20 customers will join 143 other Consumers Energy electric customers already participating in the Experimental Advanced Renewable Program. Consumers Energy purchase of customer-generated solar energy is part of our plan to meet the renewable energy supply requirements in Michigan’s 2008 energy reform law. Under this $3.1 billion plan Consumers Energy and its suppliers are investing in 15 new Michigan generation sources. This includes our 100 megawatt (MW) Lake Winds Energy Park in Mason County, the 3 MW Fremont Community Digester being developed by Novi Energy, and several hundred installations that are part of the 5 MW EARP. These renewable energy supplies are helping us meet the energy law’s requirement that 10 percent of the electricity supplied to our 1.8 million customers by 2015 be generated from renewable energy sources in the state.